110 Kurdish political parties, organisations, NGO’s and more than 250 Kurdish intellectuals, writers, artists and political activists approved a common declaration calling UN, US, NATO, EU and Russia to stop immediately the turkish-ISIS terror. 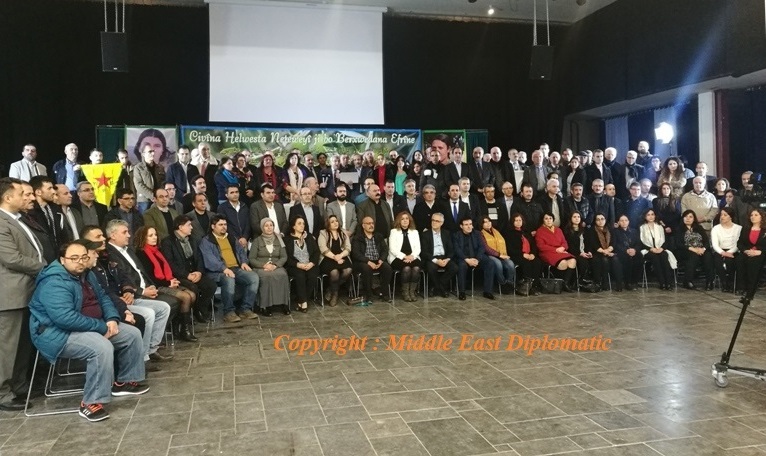 Brussels, 11 March 2018 - Middle East Diplomatic (MED) - More than 110 main Kurdish political parties, organisations and NGOs from four parts of Kurdistan Regions, including the representatives of 2 million Kurds in Europe, as well as Alevit, Kurdish-Yezidi, Turkish-democratic left, Assyrian and Armenian associations and round 250 Kurdish intellectuals, writers, artists and individual political activists gathered in Holland in solidarity with Kurdish resistance in Afrin against turkish army supported by Islamic terror gangs. The participants approved a common declaration in which they called to UN, US, NATO, EU, the League of Arab States and Putin’s Russia to stop immediately the turkish and Daesh war and massacres. The organisations underlined that since 20 January 2018, Turkish army bombarded and destroyed many Kurdish villages in Afrin, killed and injured many hundreds civilians and forced population to leave their homes. Now Kurds call to “all peoples of Kurdistan for national mobilisation started on 12 March to defend Afrin and to participate in actions day and night everywhere”. Former PYD Co-Chairman and now representative of TEV-DEM Foreign Relations, Saleh Moslem was one of the main speakers in the panel. Addressing Turkey, UN and other international actors, Moslem said: “Nobody has the right to tell the people of Afrin to leave. That land belongs to the people of Afrin. The children there are protecting their lands. Why should they abandon it?" Several participants underlined that “NATO-member Turkish army with its supporters, especially Al-Qaida and ISIS criminal gangs are also killing Kurds with European weapons, particularly Germany”. “The Turkish state, which attacked Kobanê, Shengal and Kirkuk through its gangs, is attacking Afrin today. They want to finalize the massacres in those places in Afrin now. To us, there is no difference between Afrin and other regions of Kurdistan. Afrin is a continuation of the massacres in Sur, Cizre, Nusaybin and Shengal. The Turkish state seeks to finalize its massacres against Armenians, Syriacs and Kurds in the 20th century. This is not a personal issue for the Kurds. This is a matter of honour and dignity to us”, added Moslem. Speaking in 7 hours long meeting, Moslem and many other representatives called to the peoples of Europe: The Kurdish freedom resistance against ISIS and its supporters is also for your security. The terror and bombs in Europe is clear evidences of that. Your security and intelligent institutions know very well who are behind of all those crimes. Now Erdogan and its criminal Islamic terror gangs using terror and war against us since 51 days and killing Kurds with weapon made in Europe supporting Erdogan/Daesh with a double moral policy and dead silence. People of Europe should raise their voice against this in human act. -The United Nations must implement the Security Council Resolution 2401 and genuinely take a stand on the issue of the cease-fire in Syria and its practical application. -The United States of America, NATO, the European Union, and the Global Alliance against Daesh, must seriously address the issue of Afrin and use their weight to stop the Turkish invasion and remove the Turkish army and their Jihadist extremist allies from Afrin as soon as possible. -Russia must change its position and policy on what is happening in Afrin, and prevent Turkish military aircrafts from flying in Syrian airspace, and stop the ongoing attacks. -The Syrian State must act against the presence of the Turkish occupation forces in the Afrin region and come to defend its borders. The Syrian State is a member of the United Nations, and it is important to call on the international community to stop the Turkish invasion and aggression. -The League of Arab States must reject the Turkish occupation of Afrin and take practical measures to remove the Turkish military forces from the territory of Syria. -The aggressive campaign led by the Turkish state in Afrin weakens the war on Daesh, and destabilizes peace and stability efforts in the Middle East, and for this reason the international community must declare a firm stance against this Turkish regime’s aggression and stop this barbaric invasion. -The United Nations remained silent on the massacres that took place against the Kurdish people in northern Kurdistan, which gave the Turkish state the confidence to begin its brutal attack on Afrin. The Turkish forces that destroyed Cizîra-Botan, today are the same forces which are destroying Afrin and killing her children. Therefore, the United Nations must stand seriously on the issue of Afrin and take a practical and urgent position to prevent Afrin from becoming a second Cizîra. -We, the people and representatives in this gathering, affirm our commitment to support the resistance of Afrin, and say again: "Afrin is Kurdistan, and to defend Afrin is to defend of all Kurdistan. We will defend ourselves with all our capabilities. We ask once again all the people of Kurdistan, from parties, organizations, institutions, and individuals, to come together and work for Afrin at the highest levels. -We call all peoples of Kurdistan for national mobilisation from 12 of March to defend Afrin and to participate in actions day and night.